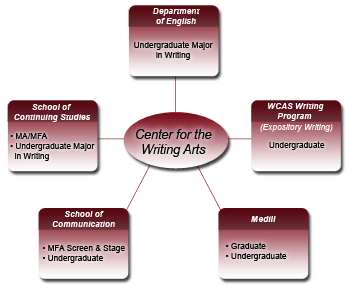 The purpose of all CWA activities is to create, support and further undergraduate and graduate opportunities for the study of writing at Northwestern, both within CWA itself and across the university; to facilitate a continuing discussion in the university community about how best to foster and situate writing as a crucial part of a university education; to help coordinate the university's multifarious courses and programs in writing across departments, programs and schools; and also to welcome audiences from the metropolitan area to the rich array of public events on campus that are focused on writing. The Center sponsors Visiting Writers in Residence who teach for one quarter. The annual one-quarter undergraduate course “The Art of Nonfiction: Exploring Writing for Social Change” (co-sponsored by the Center for Civic Engagement and taught by Robert Gundlach, Director of the WCAS Writing Program).